This is an amazing feeling, to know that we have already won an Olympic medal. That’s why that semifinal is sometimes so difficult. You know that if you win that, at least you’re going home with a medal. If you lose, nothing is guaranteed. But at the same time, we’re here for one colour. That’s our main goal — to win gold. At the beginning, I think we focused on that too much. But now that’s the only thing we need to focus on. We’re in that final, we’re where we want to be. Earlier on, we needed to let the end goal be off in the distance and focus on the present. If we can just focus on what we can control, our own individual performances, support one another, bring the energy that our team is known for, I think we’ll be right where we need to be at the end. It was a lot of fun tonight against China, and obviously it’s way more fun if you win. At the same time, we wanted to bring that emotion that we know makes our team successful. As you can see from our facial expressions and sometimes from our body language, we live and die on every shot. But that’s what works for us. I thought we did a really good job of bringing the emotion, controlling the emotion and also having a little bit of fun out there. 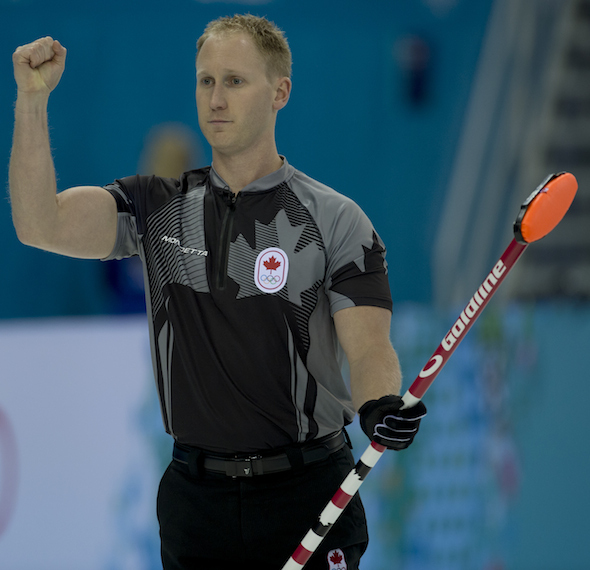 Team Canada’s E.J. 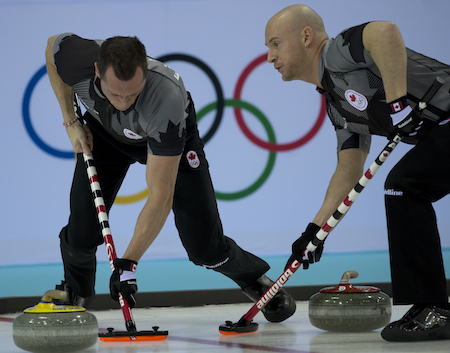 Harnden, left, and Ryan Fry sweep a rock during Wednesday’s semifinal. We let everything else go during the last couple days that we had off and looked at everything as a clean slate, and had a little bit of fun with it. We played some floor hockey, played some ping pong, and we just enjoyed the time and our experience here at the Olympic Games. Then we turned the switch and got ourselves ready for where we needed to be tonight. I think the time off was phenomenal for us, both physically and mentally, to get us back to where we wanted to be, which was the playing form we had at the Trials, and I think we were almost there tonight, and we have some room for improvement for the final. We’ll just stick to the routine before the final on Friday. Just because we have days off doesn’t mean we’re laying around doing nothing. We’re giving ourselves rest, but at the same time keeping active so that we don’t get lethargic. Meals at the same time, gym at the same time, making sure we prepare for success. Tomorrow won’t be any different. We’ve had the privilege of getting to know a lot of quality Canadian athletes. The women’s hockey team, Heather Moyse and Kaillie Humphries (AWESOME gold medal tonight, girls!!! ), Tessa Virtue and Scott Moir, the hockey guys — we’ve been able to share our stories as athletes and we’ve been supporting each other; it’s been an awesome, awesome experience. You know we’ll be cheering for Jennifer and the girls when they play Sweden for the women’s gold medal tomorrow. They’ve played awesome and I’m really hoping they can get that gold. Their game is at 8:30 a.m. Eastern time on CBC. Then it’ll be our turn on Friday — same time, same channel! Thanks to everybody back home for the support and good wishes!